The Mauritius Post released on 1 August 2015 a new Rs17 stamp to mark the opening of the 9th Indian Ocean Islands Games (IOIG) in Réunion. 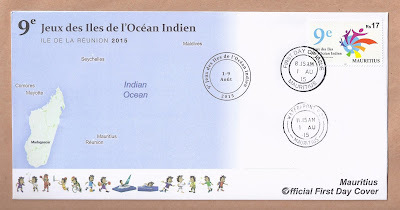 The Indian Ocean Islands Games (Jeux des îles de l'Océan Indien in French) is a regional multi-sport event held every four years among athletes from islands of the Indian Ocean. The games were adopted by the International Olympic Committee (IOC) in 1976 and currently gather the islands of Mauritius, the Seychelles, the Comoros, Madagascar, Mayotte, Réunion, and the Maldives. Albeit both belonging to France, Mayotte and Réunion participate as two distinct islands under the French flag. The number of athletes participating has increased over the years, from 1000 in 1979 to over 1500 in 2015. - build friendship and promote mutual understanding among the populations of the islands of the Indian Ocean, in the spirit of Olympism. Such Games enhance the sense of belonging to one's national flag. The IOIG are held in each country on a rotational basis and as per the level of sports infrastructures available in the country concerned. This year's 9th edition is held in Réunion from 1st to 9th August - the football tournament started on 31 July. Mauritius (Club Maurice) will have a delegation comprising more than 400 athletes (including Paralympic ones), coaches, paramedical and officials. The government of Mauritius through the Ministry of Youth and Sports invests heavily in the Sports Federation and has created Club Maurice to attract funds from the private and the public sectors companies to participate in the preparation of our elite athletes. 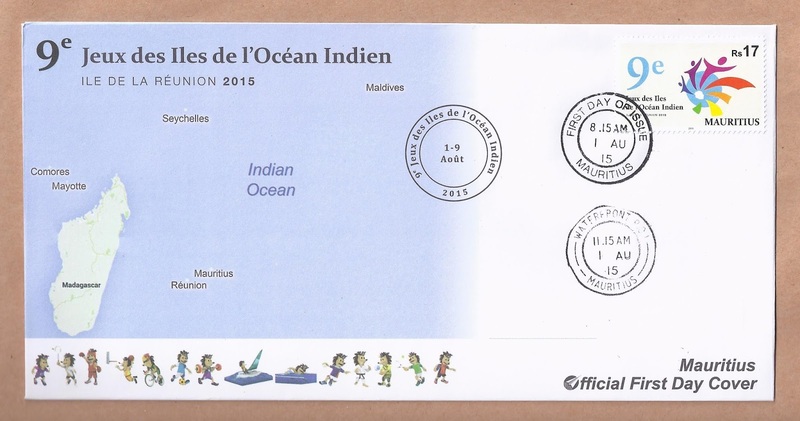 The postage stamp portrays the logo of the 9th Indian Ocean Islands Games. The FDC illustrates the geographical locations of the participating islands in the Indian Ocean. It is sad to note that Rodrigues was left out of this map, knowing that Rodriguan athletes do participate in the IOIG, under the Mauritian flag, and that the first Mauritian Gold Medal at these 9th IOIG was won by a Rodriguan athlete, Antoinette Milazar in the half marathon (21.0975 km), establishing a new record as it is the first time that this discipline is featured in the IOIG. The heading on the FDC is written in French and only the Comoros are written in French (Comores), the other islands are either in English (Mauritius, Réunion) or written the same in both French and English (Mayotte, Seychelles, Maldives & Madagascar) making it unclear whether they were intentionally written in either of those two languages. Of all the participating islands, only the Maldives are not historically linked to France. 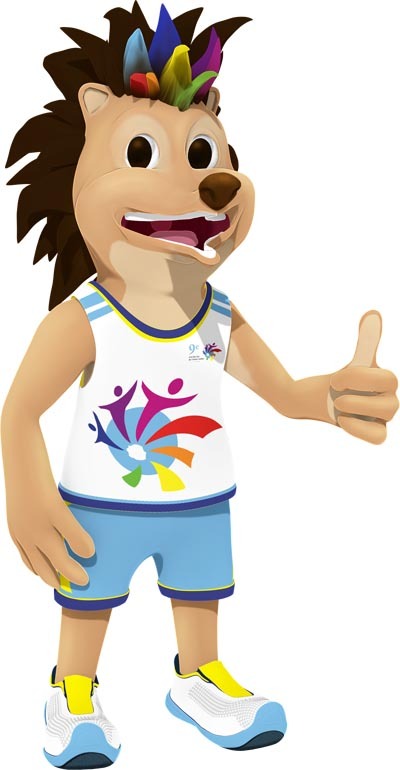 Besides, the mascot of these 9th IOIG, Tibayoun, a hedgehog, is also featured on the FDC in pictograms performing the 14 sports disciplines. Tibayoun is the son of Bayoun, the mascot of the 5th IOIG and the lasts held in Réunion in 1998. 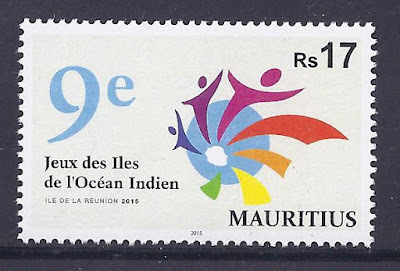 Mauritius hosted the IOIG twice, in 1985 and in 2003; stamps were released on both occasions.